I was the biggest fan in the world of Jack and jack. Litterally, theses boys had me messed up more then that joke made at the beiber roast about his mom. I had my fan account, @jackj.is.bae , but I only had 970 follows. This day was my lucky day. Jack Johnson like my photo, not just any photo but a selfie of me. I&apos;m only 17 an he is like technically 19. Well I mean we could date, Gilinsky an Madison are so hey why not me. I&apos;m older then her anyway, turning 18 in October. 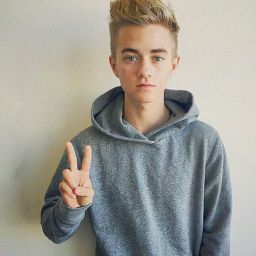 That&apos;s not the point thoe, jack Johnson noticed me, he noticed wat I looked like. Oh crap, what if he thought I was ugly, what if he though I looked bad, an what if he thought I was fat.Emily just shut up and enjoy your moment, I started dancing around my room cheering an screaming then I got a DM. From.... Jack Johnson OMG OMG omg. I opened it. Hey, so you are a fan right? really? I am A fan that is crazy about you, and you want to get to know me. Him and I continued talking for the rest of the night. We walked bout hobbies n technical things we do on a daily basis. Then he asked a weird question "I&apos;m going to UK soon an uh I kinda want you an a friend to come so w can like actually hang out is that okay"
Good great then I&apos;ll see you then. Uh yeah pay goodnight. Okay Kaylin let&apos;s do this. We departed the plan and went to go get our bags. Then I felt a tap on my shoulder I turned around and saw Jack. I almost flipped I didn&apos;t know he was going to be here. "Omg jackkkkk ahhh sorry gosh like what are all doing here" i SAID. "Came to pick you up"
"Jack you didn&apos;t have to"
"No em I wanted to"
"Alright love birds let&apos;s go" gilinsky said behind us. It felt like a dream. My two favorite idols were standing in front of me picking me up at a airport. And to add on to it we are in the frickin UK. We left the airport and wen to the hotel. The place was nice, I was sharing a room with kaylin and of course jack an back already a their room. Jack came in my room while kaylin went on her shopping spree. "So you happy your birthday is tommorow"I said. "I mean yeah duh like well I&apos;m going to be 19"he said. "Er ma gerd we should do a you now til 12 then celebrate your birthday"I yelled and grabbed my laptop. I turned on you now and said hi we waited for people to get on. We did the you now til 11:55 because we were tired. He stayed in my room till 12 thoe. But w ha no idea were kaylin was. When the clocked reached 12, jack was officially 19. "Yyyyayayyayaayyayayya its yo birthday happy birthday"I said. I went to go hug him but our lips met instead. The kiss was slow and long but passionate. We kept kissing till there was a knock on the door. Jack just blushed and rubbed his neck. He opened the door an it was Kay.